Taupor volcanic zone (TVZ) is the currently active volcanic arc and back-arc basin of the Taupo-Hikurangi arc-trench system, North Island, New Zealand. The volcanic arc is best developed at the southern (Tongariro volcanic centre) end of the TVZ, while on the eastern side of the TVZ it is represented mainly by dacite volcanoes, and in the Bay of Plenty andesite/dacite volcanoes occur on either side of the Whakatane graben. The back-arc basin is best developed in the central part of the TVZ and comprises bimodal rhyolite and high-alumina basalt volcanism. Widespread ignimbrite eruptions have occurred from this area in the past 0.6 Ma. Normal faults occur in both arc and back-arc basin. They are generally steeply dipping (>40°) and strike between 040° and 080°. In the back-arc basin, fault zones are en echelon and have the same trend as alignments of rhyolite domes and basalt vents. Open fissures have formed during historic earthquakes along some of the faults, and geodetic measurements on the north side of Lake Taupo suggest extension of 14±4 mm/year. In the Bay of Plenty and ML=6.3 earthquake occurred on 2 March 1987. Modelling of known structure in the area together with data derived from this earthquake suggests block faulting with faults dipping 45°±10° NW and a similar dip is suggested by seismic profiling of faults offshore of the Bay of Plenty where extension is estimated to be 5±2 mm/year. To the east of the TVZ, the North Island shear belt (NISB) is a zone of reverse-dextral, strike-slip faults, the surface expression of which terminates at the eastern end of the TVZ. On the opposite side of the TVZ in the offshore western Bay of Plenty and on line with the NISB is the Mayor Island fault belt. If the two fault belts were once continuous, as seems likely, strike-slip faults probably extend through the basement of the TVZ. When extension associated with the arc and back-arc basin is combined with these strike-slip faults, the resulting transtension provides a suitable tectonic environment for caldera formation and voluminous ignimbrite eruptions in the back-arc basin. The types of volcano in the TVZ are considered to be related to the source of magma and overlying crustal structure. Lavas of the arc are probably formed by a multistage process involving (1) subsolidus slab dehydration, (2) anatexis of the mantle wedge, (3) fractionation and minor crustal assimilation and (4) magma mixing. High-alumina basalts of the back-arc basin may be derived by partial melting of peridotite at the top of the mantle wedge, while rhyolitic magmas are thought to come from partial melting of lavas and subvolcanic reservoirs associated with the southern end of the Coromandel volcanic zone. 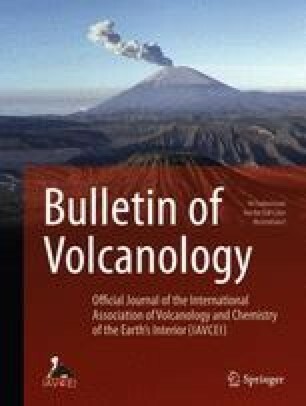 Extreme thinning associated with transtension in the back-arc basin will favour the eruption of large-volume, gas-rich ignimbrites accompanied by caldera formation.